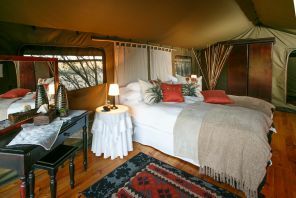 A unique feature of Chandelier is our luxury en suite tented accommodation. 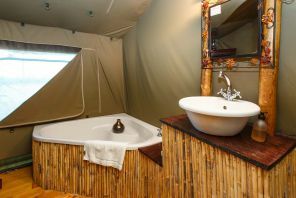 The tented chalets offer a unique bush experience - quality is in the detail. 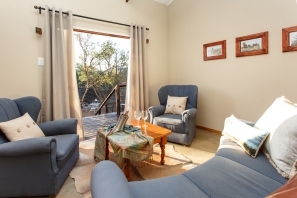 The chalets are placed on wooden decks in the bush and great care has been taken to assure privacy and unique views. Each en suite unit has a private observation deck from where guests can spot various game species on their way to the water hole. 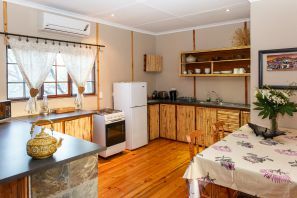 The lodge sleeps 16 people in eight private chalets equipped with white linen and velvet, as well as corner or spa baths and air conditioning or fans. 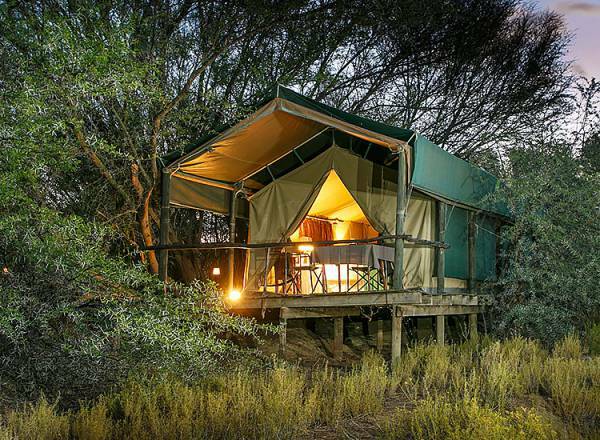 The stylish décor creates superb luxury, under the canopy of the acacia trees. The showers, with only the stars as a roof, are something to experience. Guests are woken every morning with the beauty of birdsong. Children are welcome and up to two small kids may share with their parents. The tented accommodation has been inspected and approved as four stars, but we have decided to go with three stars, though. The chalets have been rated as "Highly Recommended" by the popular Drive Out magazine, recently. The thatched, fully equipped self catering unit sleeps eight. The unit consists of four bedrooms (1 x double and 3 x twins) with two gas operated showers. 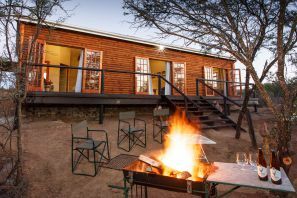 An outdoor braai (lapa), with fire wood supplied, is available for guests. People come to Chandelier and the Klein Karoo for our great natural beauty in mountainous surroundings - they stay for our warmth and hospitality. Chandelier consists of 3500 ha of succulent Karoo, river bush veldt and Cape "fynbos". The 122km of "land rover tracks" make game viewing safaris on Chandelier an unforgettable experience, creating timeless memories. Chandelier hosts a large population of antelope - 23 species in total. Large numbers of game, such as Sable Antelope, Lechwe, Waterbuck, Bontebok and Kudu are free roaming the rolling hills. 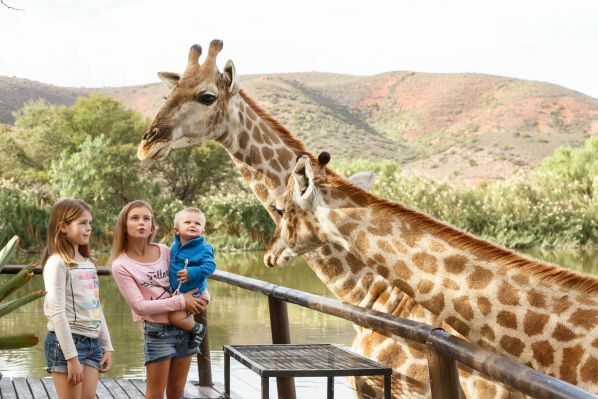 Spot the giraffes from the comfort of the land rovers or come real close to the animals on either the quad bikes or on foot. If you are lucky, you may spot the elusive black backed jackal or even catch a glimpse of the rare, indigenous leopard. 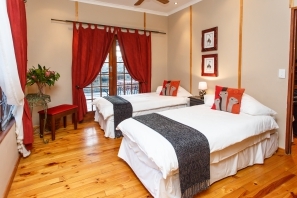 The lodge is 7 km from Oudtshoorn and 48 km from George and the George Airport (Transfers available from George Airport, on request).